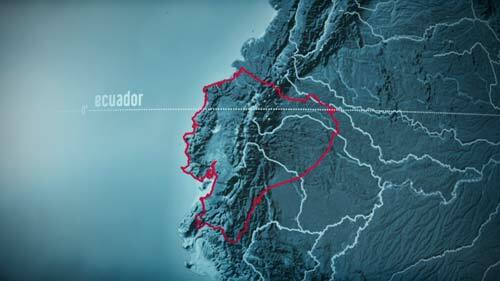 The Yasuni National Park, we learned during our interviews for the film, is the largest national park in Ecuador. Also, it’s perhaps the one that holds the highest biodiversity, holding the most species to still be discovered. Nevertheless, in spite of all this, it has hardly been mentioned to the general public. That is, until the Yasuni-ITT Initiative began in 2007. Eduardo Pichilingue, who was working at the Ministry of the Environment, told us a few interesting things about the Park which are not part of the statistics. The fact that it has not been much publicized, he said, has perhaps a lot to do with the interests of the oil companies to get the drilling concessions. If people know of it’s ecological importance, if the media focuses on all the different aspects which make it unique, not only in Ecuador but in the world, oil drilling leases would be much harder to come by. So the Yasuni National Park has been kept in the dark, its forests, its species, its people, not just forgotten but covered by a veil of strategic indifference. Another interesting detail that came across during other interviews, especially with the journalist and writer Milagros Aguirre, who was working for the Labaka Foundation on the illegal lumber business, was the fact that the Yasuni-ITT Initiative, perhaps due to the vast ignorance of most people about the area, was a formless map painted with strokes of misunderstanding. For example, when the proposal was presented at first, it seemed that the entire Yasuni National Park was being protected by the project to leave the oil in the ground. This, as the name itself implies —“Yasuni-ITT Initiative”— was not the case. The nearly one million hectares of natural reserve were not part of the deal, but only the ITT oil field, around 200 thousand hectares “only”. So at first confusion arose when the German Parliamentarians arrived and realized that it wasn’t the entire Yasuni which the government was offering to protect, but only a relatively small portion of it. In our interviews with Esperanza Martinez, of Acción Ecológica, one of the most radical nature preservation NGOs in Ecuador, stated that even though the national park was founded in 1979, and declared by UNESCO as a World Biosphere Reserve in 1989, there actually are oil fields in operation leased by the government to various oil companies. This was another shock to visitors. How could it be possible that a nature reserve of such importance could host such an ecologically detrimental activity? The Yasuni National Park is, in fact, the home of five oil fields: Block 14, to the west; Block 17, to the southwest; Block 16, in the center north; Block 31, in the north east; and finally Block 43 or ITT, in the east. What the government was proposing with the Yasuni-ITT Initiative was to stop the imminent exploitation of the already explored ITT oil field, with proven reserves of crude comprising 20% to 25% of Ecuador’s total oil reserves. The ecological movement arguments stated the need to include Block 31, right next to Block ITT, in the proposal, as it was considered a “buffer zone” and its oil reserves are not really significant. In fact, the more radical defendants said that the entire Yasuni National Park should be off-limits to the oil companies. Such a measure, however, would be basically depriving Ecuador of most of its oil extractive capacity, so from the economic point of view, this proposal is clearly a political and economic dead-end. Trying to make this one of the conditions for the Yasuni-ITT Initiative can be considered too radical a move on the part of the ecologic movement which wishes to ban oil exploitation altogether. Also, others said, it could prove the demise of the first serious governmental initiative to take steps towards a post-petroleum era. Before exploring some of the facts of the territory itself, let us take a quick look at the map. The Yasuni National Park has the shape of a horseshoe, with the opening to the west, the eastern limit bordering with Peru. The area within the horseshoe is the Waorani Territory, which according to Eduardo Pichilingue, may have been made legally independent from the Yasuni National Park, which was originally over 2 million hectares, in order to allow oil companies to deal directly with the Waorini nationality in the hopes to cut better deals for the industry. So we now know that the Yasuni-ITT Initiative only considers the ITT oil block (Block 43) as part of the deal to leave the oil in the ground, rather than the entire national park. Now, the other strange issue that we found during our interviews was the lack of knowledge regarding the difference between the Block 43 or ITT, and the ITT Zone. The initials (ITT) call for confusion. Whether intentional or not, it’s hard to tell. We doubt it’s intentional, it’s just one of those things that happen, but nevertheless the end-result is one of blank looks when the questions arose: What is the difference between ITT Block and ITT Zone? The ITT Block is an oil field, and the ITT Zone is the an area called the Yasuni Intangible Zone where no-one is allowed to enter, at least not legally. The difference, on a map, is simple: The ITT Block or oil field #43 gets its name from four exploratory wells: Ishpingo (North and South), Tambococha, and Tiputini. These exploratory oil wells were drilled to find out how much oil was in the area, what type of oil, and the economic feasibility with came back with positive results. A technical study was ordered on the best ways to extract the oil. 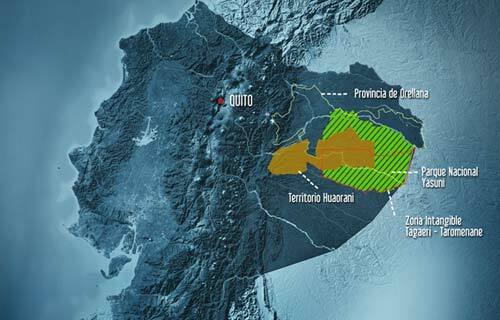 However, just before the leases were drawn up for the extraction of that oil, the Yasuni-ITT Initiative was officially presented and all further activities in the ITT Block were stopped. Yasuni film has tried to steer away from the political conundrums as much as possible. Another interesting fact about the ITT oil field is that two of the unnamed exploratory wells, south of the Isphingo Sur, are within the ITT Zone, and as that is really supposed to be off limits to any oil company, the plan for exploiting the oil from that area was to drill at the border of the Intangible Zone, and through horizontal drilling, access the oil in existence under the ground of the Intangible Zone. Because the southern part of the ITT Block is actually within the ITT Zone, which stands for Zona Intangible Tagaeri Taromenane —Intangible Tagaeri Taromenane Zone. The Intangible Zone was created in 1999 to protect the native people known as Tagaeri and Taromenani, or “People in Voluntary Isolation.” It’s an area in the south of the Yasuni National Park with around 700 thousand hectares of jungle. It’s the home of the Tagaeri and the Taromenani (also known as Taromenane), but also inhabited by contacted Waorani. This is one of the dilemmas. The decisions made about the Intangible Zone of the People in Voluntary Isolation are solely in the hands of the government officials appointed to protect that area, as was Eduardo Pichilingue before he left his job at the Ministry of the Environment. And the Waorani who live in the area, down the Shiripuno River, who have been contacted by civilization, asked why they are not consulted, as they not only live there, but are in constant communication with society. In fact, Penti Bahiwa and his family live there, they receive tourists, have a radio, outboard canoes put at their service by the Ministry of the Environment, and Bameno maintains an airstrip for small planes. Nevertheless, it seems as if because they live in the ITT Zone, that they must abide by the rules set by the government to “outsiders”, which limits the use of firearms, and according to some new regulations, even the use of outboard engines, hunting, fishing, and the entry of anyone who isn’t from the area. This is when it becomes clear that the map is not the territory, as they see no difference between the Intangible Zone of the Tagaeri and Taromenani, and the Waorani Territory drawn on Ecuador’s maps. For them, the Waorani lands went all the way from the Napo River in the north, to the Curaray in the south. And the reason why the Intangible Zone of the Yasuni National Park (there is the Intangible Zone of the Cuyabeno National Park as well) has been kept mostly unharmed, is because they, the Waorani, together with the Tagaeri, have repelled any “kuguris” —invaders. As the Yasuni-ITT Initiative concentrates on the protection of the ITT Block, some people wonder what will happen with the ITT Zone. Currently, the law protects that area, and lately the government has began to enforce the laws of non-exploration and non-exploitation of lumber. However, as the roads that reach south to the very border with the Intangible Zone have been asphalted, and the oil frontier needs new wells to keep up production, a huge question mark hovers over the ability of the government to keep the Intangible Zone safe. Which brings another predicament to light as they are finding Tagaeri, legally protected by the Constitution of Ecuador, in areas outside the Intangible Zone of the Tagaeri raising an important question. Are they as protected outside of the ITT Zone as they are inside it? Order now with Falter Verlag or filmdelights. Let’s bring this film around the world!